Frances Largeman-Roth, RDN, is a New York Times best selling author and nationally recognized health expert. Frances was the Food and Nutrition Director at Health magazine for nearly eight years. She is a contributor to Today.com and Parents magazine. Frances is a sought-after spokesperson and provides private nutrition counseling to clients through her HealthyHousecalls. Frances is a frequent guest on national TV, including the Today Show, Good Morning America, Access Hollywood Live, CNN, The Rachael Ray Show, and The Dr. Oz Show. She also hosts The Milk&Honey Kitchen with Frances on YouTube. 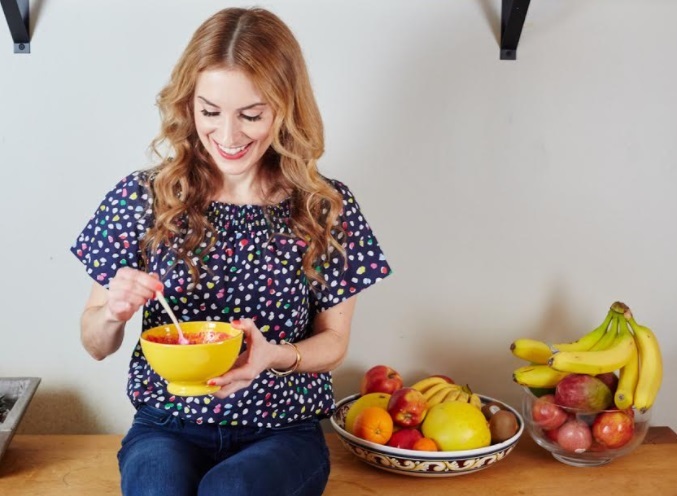 Frances is the author of Feed the Belly: The Pregnant Mom's Healthy Eating Guide and co-author of the bestselling The CarbLovers Diet and The CarbLovers Diet Cookbook. Her latest cookbook is Eating In Color: Delicious, Healthy Recipes for You and Your Family. Frances earned her undergraduate degree from Cornell University and completed her dietetic internship at Columbia University. I am good at setting a goal and going after it. I am pretty dogged in my approach to things and like to get stuff done! I am a Capricorn and therefore very stubborn! Capricorns are used to facing hurdles and setbacks, but we always persevere. I really think my tenacity is what has made me successful. There are certainly plenty of people along the way who tried to dissuade me from starting my own business. Personally, I’d love to someday have a home in the Hudson Valley or Western New York, where my family can spread their wings and enjoy nature, and where I can have a big kitchen that everyone feels welcome in and a lovely garden out back. And I’d like to continue to help people eat healthier and lead more balanced lives. That might be through more books, video content, recipes, or even my own line of healthy food products. My biggest success, other than creating a wonderful family, is that I can live and work in NYC and be my own boss. I never thought it would be sustainable, but if you put the work into building the foundation for a successful business, it will grow and flourish. I was pregnant with my second child and my mother had just died of cancer. My job as a magazine editor was prestigious, but extremely stressful and I knew it wasn’t sustainable for the long haul. I made the decision to leave my full-time job with benefits and try to make it work as a fulltime freelancer. I made that decision over five years ago and I’ve never regretted it. Dream it, Do it! I am a big believer in the power of visualization. If you can see yourself achieving a goal (having kids, losing weight, owning a business), you’re much more likely to achieve it. And writing your goals down is also extremely powerful--so put it in your journal baby! Sarah Jessica Parker has long been an inspiration to me. She is a mother, wife, actress and a business woman. She admits that all of these roles aren’t necessarily easy to balance, but they all make her life richer. And Lena Dunham is so brilliant! She is absolutely honest and bold in her decisions and I can’t wait to watch her carve out more opportunities for women filmmakers, writers and actors. Also, the co-founders of Physique57 are an inspiration to me. They are best friends and business partners and truly help inspire women to be their best selves. Maui is just incredible! Nothing smells as good as the beach air there. I also am very fond of a resort in the Catskills called Mohonk Mountain House. The location is stunning, the atmosphere is relaxing and they have a top-notch spa. And I recently visited Copenhagen, which is such an incredible city for food and design. I’d go back there in a heartbeat! I love May Designs notebooks. They help keep me organized, while keeping me inspired with their beautiful designs. I also really enjoy my Apple Watch--it’s like having a workout partner on your wrist. The sheets from Serena and Lily are gorgeous. These are not boring and plain sheets--they are color saturated and make me want to wake up and take on the world! My husband and I are big sci fi nerds and are obsessed with Game of Thrones. It will be a long time until the next and last season airs, so we’re excited to dive into the season 2 of Stranger Things on Netflix. I am also trying to improve my running speed, which is tough as you get older. But adding strength moves and working on mobility can help you gain speed. And finding joy in the ever day is something I’m working on. Life is short and it can be very hard at times, so looking for those small moments where things are wonderful is super important. It can be the feeling of the warmth of the sun on your face, to appreciating the crunch of an apple, to watching your child sleep.